We’re a share cost ship that has been sailing since 2004. 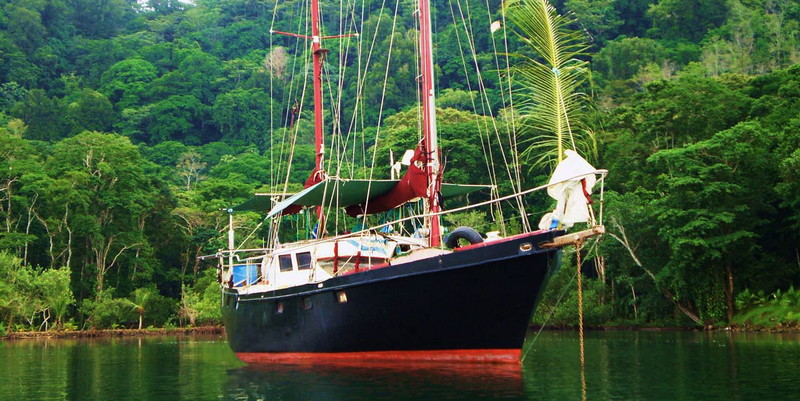 Karaka is an old school steel ketch, big, tall, wide, heavy, black, gnarly, full of character. She was abandoned for years in Hong Kong, bought for 1$, and has circumnavigated since with a crew of sea vagabonds. The crew is usually composed of a healthy mix of nomadic wanderers and non-conforming individuals but anybody is welcome, regardless of nationality, age, gender, worldview, background, or financial status. Attitude is what matters. In an effort to share, learn and grow, we take as crew anybody motivated to join with an open mind, a willingness to become part of the team and a deep craving for this lifestyle. The boat is operated as a non profit cooperative. We run on limited funds from crew contribution and so we’re not a luxury yacht, yet the boat is sound and strong, especially after our recent extensive refit. Somehow, because of our alternative lifestyle and eclectic past crew, plus a reputation gained in our younger and wilder past, people sometimes get the impression we are a full-on hippy boat. We’re not. We’re down to Earth, practical, no nonsense and responsible sea gypsies. We try to select crew with those attributes also. We have just completed a year long refit in Malaysia and we are exploring the South China seas and Indonesia for the rest of 2018 before we cross the Indian Ocean next year. We are on the move and we regularly have openings for people to join us. This is more than just a cheap sailing opportunity, this is a chance to experience what being a feral sea gypsy on a nice ship is all about. We try to have people on board trying to make it work as a long term community, possibly putting together projects, either just for fun or for making some extra funds to finance the trip… it can be artistic such as busking in the street all together or even playing gigs if the musicians are good enough, or getting involved with some community project in the islands, do workshops with the locals sharing skills and knowledge, help out with the environment, create awareness videos, things like that. Trying to be a bit more than another bunch of tourists on holiday. For more info, please browse this website, staring with the video below. For crewing applications, please see the info on the Contact page.